Staying in and watching a movie can sound ideal, especially if Audio Innovations has perfected the experience with the latest, best, and most reliable equipment. There are some nights when just staying in and watching a movie together sounds heavenly, especially if your system is equipped to maximize the picture and the sound the same way that filmmakers intended for the big theaters. Jess Goitiandia and the crew at Audio Innovations just completed a home theater where the sound is bold and heart-pounding and the visuals are totally immersive, matching the sensory qualities of going out to watch a film on the large screen. But instead of rallying and getting dressed up, you can settle in to the comforts of your own home, putting on a favorite pair of sweats or cozy pajamas and fuzzy slippers, making snacks, and hanging out with your friends or loved ones. Home theaters have been around for a long time now, but like with most things, technology has propelled them forward, the same way it has for the films that are screened. 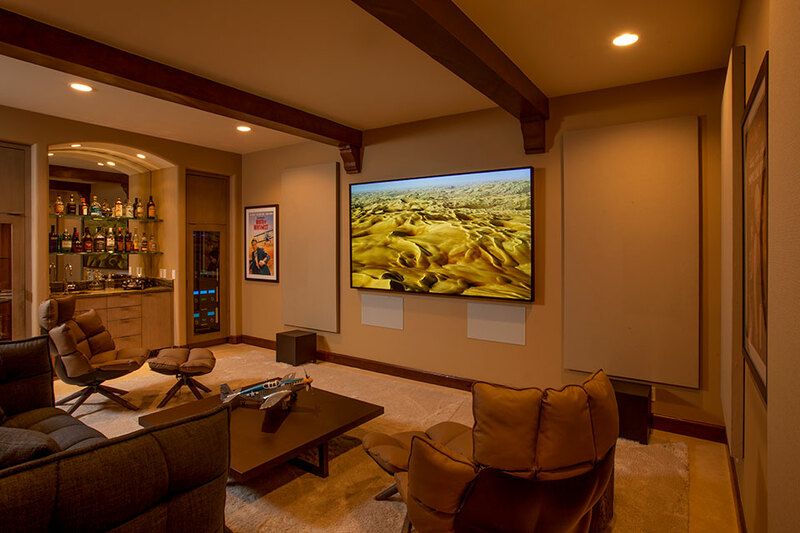 Just how far forward is exemplified by this recent home theater installation in the Wood River Valley. What stays the same is starting a film when you feel ready and pausing it if you need a break. But the equipment is far different from the days when home theaters first emerged. “Big screen” is a fair description of the 98-inch Planar 4K ultra-resolution television. “The resolution and picture quality of this screen has not been seen before in large-format LCD displays. It has four times the resolution and pixel density than any television of its size for incredible clarity,” Jess Goitiandia explains, noting the 4K native resolution. He also points out that it operates without fans to make it extra quiet. Audio reaches clarity with no background hum. 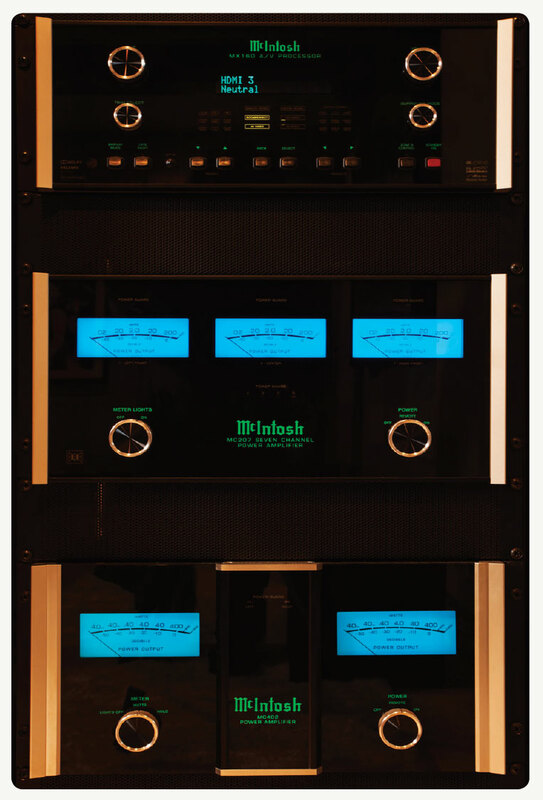 Audio Innovations has long relied on McIntosh for audio quality and is a licensed dealer. Founded in 1949 and still headquartered in Binghamton, New York, McIntosh was an early innovator in audio and still designs and handcrafts its products. “What impresses me about McIntosh is how they move forward and are still innovating and keeping ahead of the industry, while retaining high standards for quality,” Jess comments. McIntosh moved early into home theater processors. For this installation, Audio Innovations relied on the McIntosh MX160 A/V processor that supports Dolby Atmos and Auro 3D and is 4K Ultra-High Definition for fine video quality, as well. Jess adds that it supports object-based 3D audio formats for an immersion sound experience, and features Room Perfect, a room correction technology. For amplification, Audio Innovations installed the McIntosh MC402 amplifier, which reviewers praise for its rich, warm, controlled sound, in tandem with McIntosh MC 207, which delivers 200 watts of power to over seven channels to each speaker with no cooling fan to add noise. The seven McIntosh WS 350 in-wall speakers are all wall-mounted for aesthetics. These are configured with an aluminum back to minimize sound transmission to adjoining rooms and each has one eight-inch woofer, one four-inch midrange, and five one-inch tweeters. “To further eliminate induced background noise and leave the music and sound pure, we installed XLR connectors, McIntosh’s balanced gold-plated cables,” Jess notes. For subwoofers, Audio Innovations relied on a product from Bay Audio, a custom speaker company based in the San Diego area. “They have factory tuning based on worksheets I complete on the dimensions and finishes in the room. They are tuned and ready to use out of the box,” Jess adds. For this project, as for many of their installations, Audio Innovations relied on a Crestron controller and remote for the simplest interface. “Our Crestron platform, whether it is the handheld remote or our touch panel interface, is intuitive and easy to use. It monitors, manages, and controls everything our clients need, from their HVAC, to cameras or garage doors. It’s easily maintained, and simple to modify and upgrade. It avoids inconsistencies and unreliable performance,” Jess explains. Audio Innovations is a locally-owned business based in Hailey, Idaho. There’s a retail showroom where you can browse the latest products and pick up connectors and cables. The Hailey location is also the base for the business’s other services. Audio Innovations is a system designer, programmer, installer, and a source for service and for reprogramming when adding new electronic components. Having Audio Innovations on the home team means that they will do the set-up and stand behind the systems, and you will get to enjoy the results.